We are one of a very few companies in the UK who make bespoke stainless steel cowls. 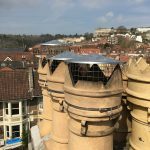 Our speciality is the fabrication of cowls for the traditional Bristol Crown and Bishop Pots but of course we make and fit normal cowls as well. When these pots were originally fired they were not accurately reproduced from batch to batch and the firing process often resulted in slightly eliptical tops as opposed to perfectly round. The internal diameters of apparently identical pots are always slightly different as well. Due to this cowls have to be made to measure for each pot. We vary their heights depending on the use to which they are to be put. 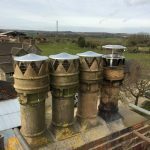 Most crown pots are at least 10" in diameter and are open to the elements leaving rain, hail and nesting birds free to enter the flue, one reason why damp occurs in properties. 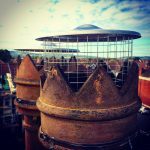 We make special low profile crown pot cowls for redundant flues to stop this. If you are measuring the pots yourself for us to fabricate the cowls for you then use this Crown Pot Measurement Form and send it in to us. 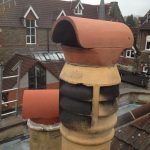 Saddle Cowls fitted to live flues are very dangerous and should be removed. Unfortunately we find many of these fitted to open fires and gas appliances, they are exceptionally dangerous and can lead to carbon monoxide poisoning, see an example below. 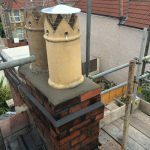 Have a look at your chimney stack, do you have one or more of these on live flues? If so do not use the appliance but call us immediately.